In addition to brewing & drinking beer I also enjoy writing about it. Here is a list of my beer related posts. The winners of the Sierra Nevada Beer camp contest collaborated to create this unique recipe which we had the distinct privilege of brewing on the pilot system at the Sierra Nevada Brewery in Chico, California. Once we found out that our beer would be out around Christmas time we wanted to make it reasonably high in alcohol (for that nice warming effect) but not just another spiced beer. So instead we went decided to go with an Imperial Red Ale. The Red Ale style is usually very accesible with it's big malty body but we decided to take it up a notch or 3. Sierra Nevada has been growing a few acres of their own organic hops on premises and we were able to harvest the last row for our beer; hence the name "Raiders of the LAST Hops". Most hops are kiln-dryed prior to use but we put our hops in "wet", fresh from the field. This gives a distinct spicy character to the beer which is only available around hop harvest time. Finally, we decided it would be intersting to introduce a subtle hint of wood character by aging (briefly) on Citrus wood. This will not be a strong, oakey, smack you in the face like a Napa cab wood character but just a nuance. And to top it all off: we added a bit of Nelson Sauvin - a bombastically fruity hop - along with the wood...because we could! Again it will be a background note because this beer is all about the estate grown hops. I had the amazing opportunity to attend Beer Camp this Summer (August 2011) at the Sierra Nevada Brewery in Chico, California. Beer Camp was created as a way to share the Sierra Nevada story with some of the brewery's biggest accounts and distributors. A few years ago, they opened it up to the beer loving public. Regular folks, like me (I use the term "regular" loosely) could compete for a chance to get the same VIP tour and brew a batch on the pilot system. All you had to do was tell them why you deserve to go to Beer Camp...in a video. 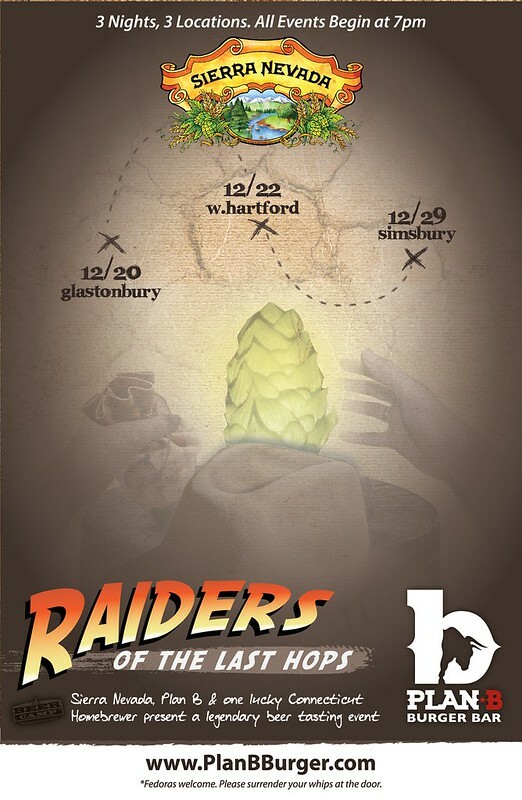 Raiders of the Last Hops Comes to Connecticut! Even if you missed the events you can always count on Plan B to have a great taplist and delicious food (I strongly recommend the Blue Chips).